The skies over the University of Hertfordshire’s Observatory at Bayfordbury were clear last night as BBC Science News Correspondent Pallab Ghosh went along to see and film the Perseids meteor shower. See Pallab's report here. It was a very good night for shooting stars – with many sightings of fireballs reported by our astronomers at Bayfordbury. 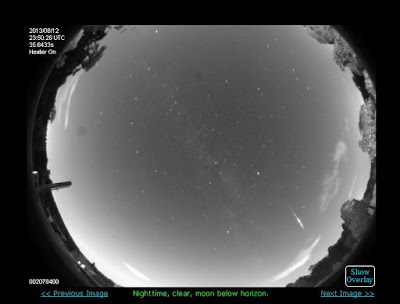 One particular fireball image from Bayfordbury was very impressive and left a persistent train visible for ten seconds (see Bayfordbury AllSky Camera image below) – and was also seen by the UK Meteor network. Last night was the peak time to see the shooting stars – but for any of you who may have missed them, there is another opportunity this evening – let’s hope for clear skies again! But do wrap up warmly as it was a little chilly outside last night!